Shifts In Weather And Strategy Help Slow Springs Wildfire : The Two-Way Firefighters in Southern California are welcoming the latest weather forecast, as lower temperatures and higher humidity could help them control the Camarillo Springs Fire. So far, only 15 structures have reportedly been damaged, in an area where rugged wilderness provides plentiful fuel for fires. 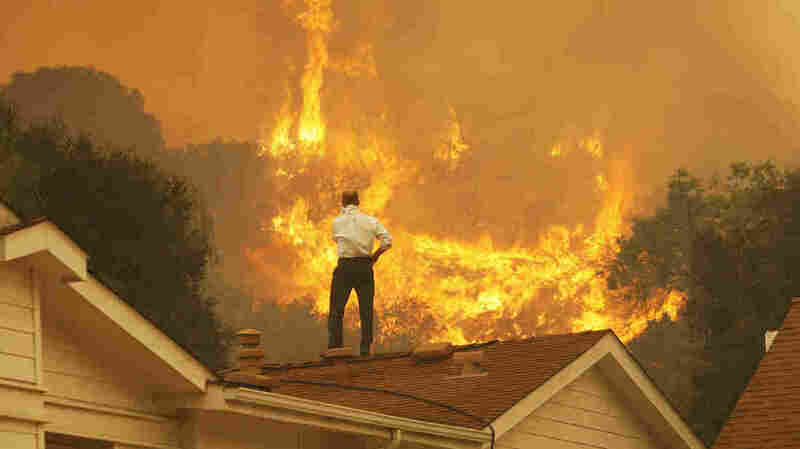 Standing on a rooftop, a man looks at the Springs fire's approaching flames in California Friday. The wildfire, reportedly, 20 percent contained, might be weakened by high humidity and cooler temperatures Saturday. Firefighters in Southern California are welcoming the latest weather forecast, as lower temperatures and higher humidity could help them control the Camarillo Springs Fire. But the wildfire along the coast remains formidable: It has reportedly burned at least 43 square miles of land and property, nearly doubling in size Friday. As of Friday night, the fire in Southern California was 20 percent contained, reports member station KPCC, which has been providing live updates on the blaze. Portions of the Pacific Coast Highway remained closed early Friday evening, despite earlier plans to reopen the road. The fire in Ventura County started Thursday morning, about 50 miles northwest of Los Angeles. After the fire spread to the beaches lining the Pacific Ocean, officials had hoped it might begin to lose momentum. But a shift in the wind sent it speeding back inland, where it filled canyons with fire and smoke Friday. Forcing evacuations in several communities, the fire has threatened thousands of homes, a university, and a military base. But so far, only 15 homes have reportedly been damaged, in an area where rugged wilderness provides plentiful fuel for fires. "[Camarillo Springs] homes were built with sprinkler systems and fireproof exteriors from the roofs to the foundations. Residents are required to clear brush and other combustible materials to within 100 feet of the dwellings, and developers had to make sure the cul-de-sacs that fill the area's canyons were built wide enough to accommodate the emergency vehicles seen on TV racing in to battle the flames." "'All of our rooftops are concrete tile and all of the exteriors are stucco,' said Neal Blaney, a board member of The Springs Homeowners Association and a 15-year resident. 'There's no wood, so there's almost no place for a flying ember to land and ignite something.'" According to The Los Angeles Times, another factor is a shift in firefighters' approach in the years since the Green Meadow wildfire destroyed more than 50 homes back in November of 1993. "With this fire, having experienced Green Meadow, our commanding officers realized much sooner that we were not going to get ahead of this fire," Ventura County Fire Capt. Scott Dettorre said Friday. "Consequently, we were able to put plans in place to minimize damage to a much greater extent. It is the lessons of Green Meadow that is allowing us to do what we are doing out here." "Nearly 1,000 firefighters are working to contain the flames, with more on the way. They've been dumping fire retardant chemicals from air tanker planes. Officials predict it could take all weekend to fully contain the fires."